Approximately 3,500 years ago, a group of hardy sea-faring individuals arrived at the remote island chain we now know as Samoa by way of clever navigation using the stars, ocean currents, weather phenomena, bird migrations, and no doubt a huge amount of luck. According to oral accounts Samoa is the center of Polynesia, and it is from these islands that settlers departed for the Cook Islands, French Polynesia, and Marquesas (and from there on to Hawaii). It wasn’t until the 1700’s that Europeans (re)discovered these remote little islands, and in today’s technology dependent society it is impossible (for me at least) to comprehend how these ancient peoples were able to find such miniscule islands in the vast expanse of the deep blue pacific waters. 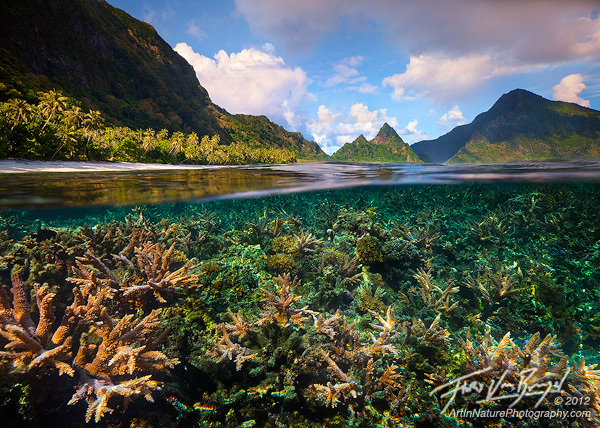 Today all it takes is a 5 hour flight from Honolulu, and you’ll find yourself in Tutuila, American Samoa. If it takes 5 hours on a Boeing 767 traveling over 500mph at 35,000 feet guided by GPS systems and satellite weather information, imagine how long it would take on a wind powered boat with no knowledge of where you’re headed! That first boat of pacific islanders were by no means the first living beings to arrive on these islands. In fact, they would have been greeted by 100’s of species of coral, thousands of fish, and of course white sandy beaches lined with coconut trees. The coconut is one of the most versatile plants on the planet, and has done a superfluous job of dispersing itself around the world thanks to its unique adaptation to drift on the ocean currents for months before germinating on a tropical beach. Coconuts have been found in all corners of the world, including Norway. Given their preference from warm and hot climates, however, that coconut probably didn’t make it for very long. 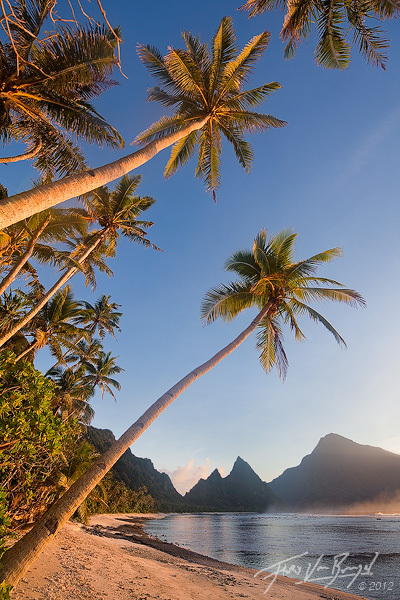 The coconut was so important to the pacific islanders that it was dubbed the ‘Tree of Life’. Young coconuts are full of a refreshing liquid called coconut water, which served as the primary source of hydration for their lengthy marine excursions (approximately 4-8 coconuts would be required per person per day to stay fully hydrated). As the coconut matures the liquid forms a rind – the white meat you typically think of as ‘coconut’. This flesh can be eaten raw or shredded and pressed into ‘coconut milk’. The coconut serves as much more than water and sustenance, however. The dense shell of the coconut, for example, is the best kind of wood for making activated charcoal. Many filtration systems, like gas-masks, use activated charcoal derived from coconut shells. These are but a few highlights of all the uses, if you want to learn more I recommend downloading this recent document that promotes the coconuts many applications (besides tropical sunset decorations): The Coconut Odyssey. My trip to Samoa was not a chance landfall such as those made by drifting coconuts, nor was it a vacation (graduate students can’t afford to go on vacation to places like this). Brian von Herzen of the Climate Foundation had invited me to come help with his Pacific Island Climate Change Cooperative (PICCC) funded project to better understand coral bleaching, and more specifically, to demonstrate methods for reversing (and preventing) the bleaching process. So what is coral bleaching anyways, and why has it become a popular topic of research over the past decade? First you’ll need to know a little bit about coral. Corals are marine animals that typically live in colonies of genetically identical individuals called polyps. 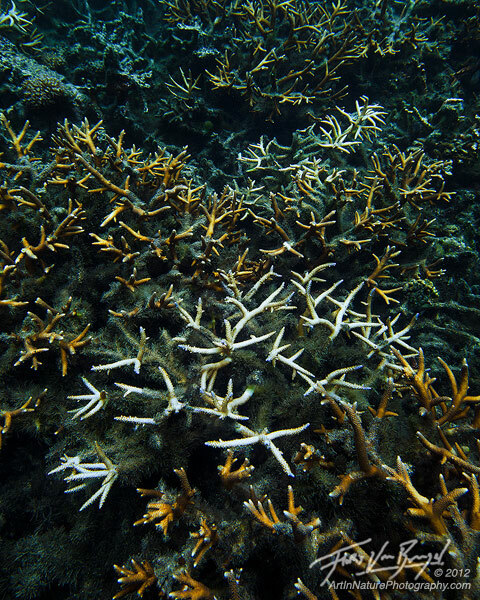 One of the better known groups of coral are the reef builders, such as the staghorn corals in the image below. The polyps of these corals secrete calcium carbonate, which gradually builds a strong skeletal structure in which the polyps reside. Although some corals feed by catching plankton with stinging tentacles, most get their energy from a symbiotic relationship with photosynthetic algae called zooxanthellae. In addition to providing energy, the zooxanthellae are responsible for the majority of the pigmentation in healthy corals. Coral bleaching occurs when the animals get stressed because of any number of factors and expel the zooxanthellae from their tissue, thus losing both the ability to produce energy as well as their color. What is left is a white skeleton of calcium carbonate. If the bleaching is not too severe the corals can re-recruit the zooxanthellae after conditions improve, but mass bleaching events can kill them off entirely. Bleached corals ~ the white corals are bleached, the brownish orange ones are healthy. One of the primary stressors leading to coral bleaching is a slight increase in water temperature (just a few degrees is sufficient! ), particularly when combined with intense sunlight. Corals are living within a few degrees of mortality every summer. High temperatures cause the coral to become more sensitive to light. Because of its extreme sensitivity to changes in water temperature, coral bleaching can be considered the canary in the coal mine of climate change. As water temperatures rise, coral ecosystems will be the first to disappear. 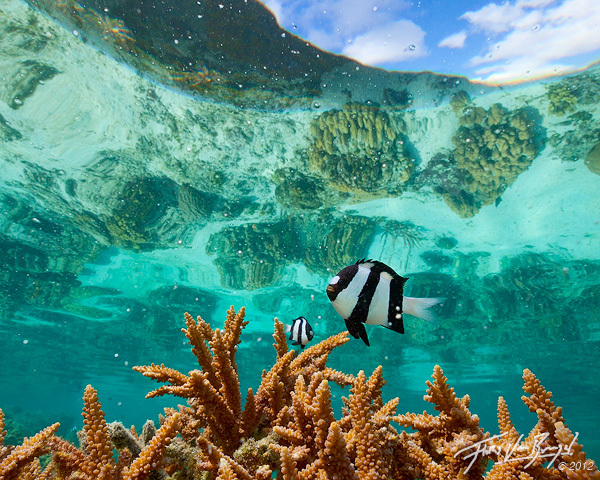 Twenty-five percent of all marine species rely on the coral reef ecosystem for some part of their lifecycle. These fish and invertebrates will lose the habitat they require for survival. From there, repercussions will be felt throughout other ecosystems, both in and out of the water. As you can imagine, understanding exactly what is going on, and how we might be able to prevent and reverse bleaching is of critical concern. In a preliminary experiment, the Climate Foundation has found that subtly cooling the reef water is sufficient to reverse (and prevent) bleaching in less than 24 hours. Our goal for this trip was to collect some additional data with a more mobile system, though we spent most of the time building and validating the mobile cooling system to be deployed later this year. Scaling this type of operation to save an entire reef system may seem daunting at first, however, there are some incredibly simple (and inexpensive) solutions that become available with the adoption of deep sea water air conditioning. 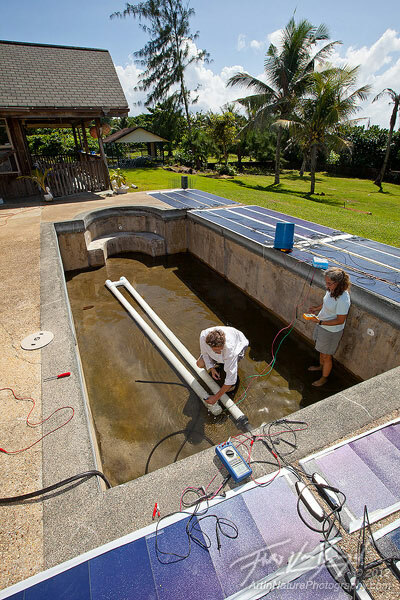 Brian and Tracy testing the mobile solar powered water cooling system in the pool. Of course, that is the pessimists view of how our future will unfold. It is possible that the corals will adapt to warmer climates. Although this is an unlikely outcome given the rate of global temperature increase, there is some hope for this view: corals in certain areas are much more heat resistant than others. 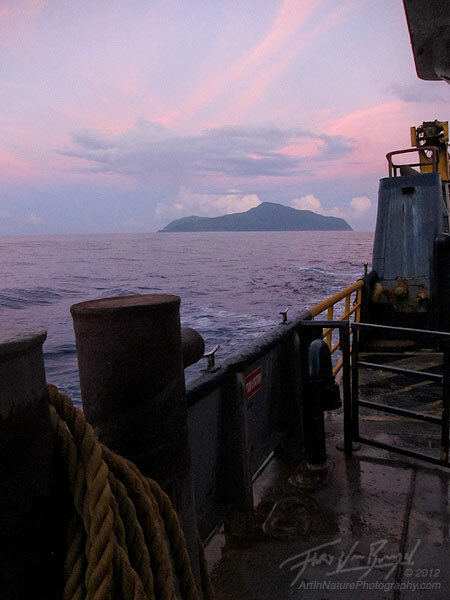 One such place is the island of Ofu, which lies a mere 50 miles to the east of Tutuila. Researchers at Stanford have been studying the coral here for this very reason. Despite the relatively close proximity, Ofu is actually quite a challenge to get to. Inspired by my friend, and world traveller/photographer, Michael Anderson, I decided to take my chances and go on an adventure to this little island paradise. The cargo ship, MV Sili, that I took to Ofu. This was during a brief stop over on Ta'u, delivering groceries. There is no regular transport to Ofu, and beyond chartering a boat or plane for exorbitant amounts of money your most reliable option is flying to the nearby island of Ta’u and hiring a fisherman to take you to Ofu. That sounds like a reasonable plan, except that the plane is broken about half the time, and locals get priority on seats (reservations don’t mean a whole lot). Also, if the swell is high, you probably won’t find a fisherman willing to go out on the high seas. So you could very well get stuck on Ofu, or Ta’u, for up to a week. 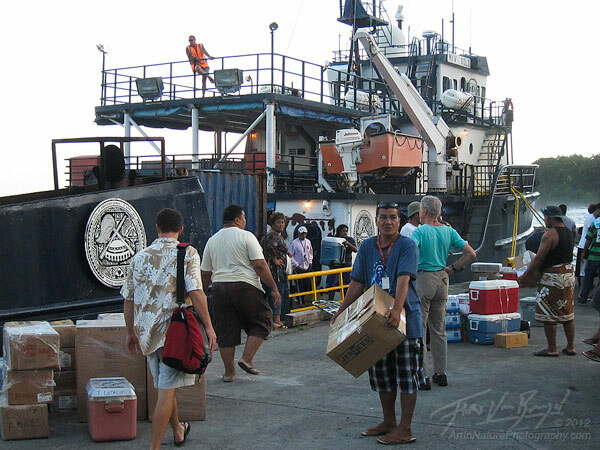 The second option is to hitch a ride on the cargo ship that departs from Tutuila approximately once a week, if it’s not broken, and the crew not detained by the coast guard. Again, there are no guarantees about getting home (but really, who actually wants to leave tropical paradise?!). During my stay the ship turned out to be operational, so I went for it. Going into my journey I was a bit apprehensive, as everyone I’d talked to had told me horror stories of waves crashing over the deck, mixing with puddles of vomit, and soaking everyone on board to the bone. I happened to go when the seas were at the calmest anyone remembered them ever being, so my 12 hour overnight journey was actually as pleasant as such a trip can be, and I made it to and from Ofu without incident. My nerves were a little calmed, too, when I met Ken and David, two brave tourists from New Mexico who were on the same boat ride as I was. Keep in mind, this cargo ship is also the only source of imported goods the people that live on these islands get. That means that if they don’t keep about a months worth of beer (or other essentials) in stock they could very well run dry before the next shipment arrives! After a dramamine induced sleep I awoke to a beautiful sunrise in the deep blue waters of the pacific ocean. Frightened flying fish flew past, and the green rugged peaks of Ofu welcomed me to this little paradise. Although the island sees very few tourists, there is a wonderful little lodge just a quarter mile from the beach called Vaoto Lodge. Jim and Marge, the friendly owners of the lodge, will cook you fantastic dinners, there’s beer in the fridge, and superb snorkeling right off the doorstep. What more could you want? The aquamarine water, clear as glass and a balmy 84 degrees F, beckons you to take a swim. Unlike most pictures you may have seen of tropical islands, this one is unique in that there are no resorts or tourists that are just barely hidden from view. You don’t need to clone out or avoid any footsteps on the beach, because there are none. I think I just need to let my images do the talking, as this place is just indescribably magical. Notes: this is a stitch of two exposures taken at different focus settings which was necessary to get the whole scene in focus due to the optics of the dome port. I spent the majority of each of my 4 days there snorkeling in the lagoon right off of National Park Beach. Yes, that’s right, it’s a US National Park – the only one south of the equator (the park is spread over Tutuila, Ofu, and Ta’u). And most certainly the one with the fewest visitors. There’s no entrance fee, and the only real evidence of the park management is a entrance sign and a few helpful information postings. 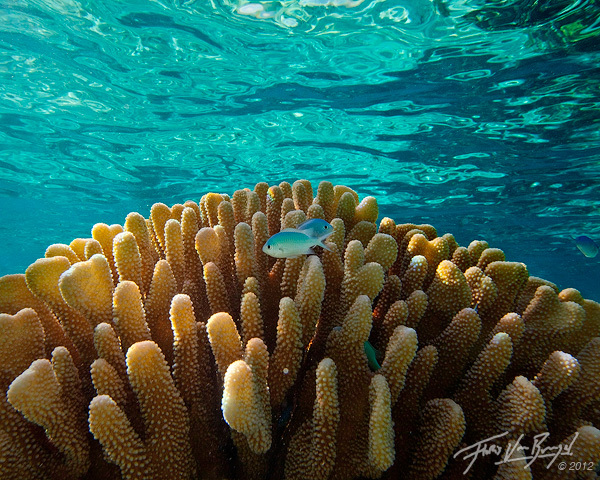 I found one of my favorite photographic angles while snorkeling to be looking up at the water surface with the camera. 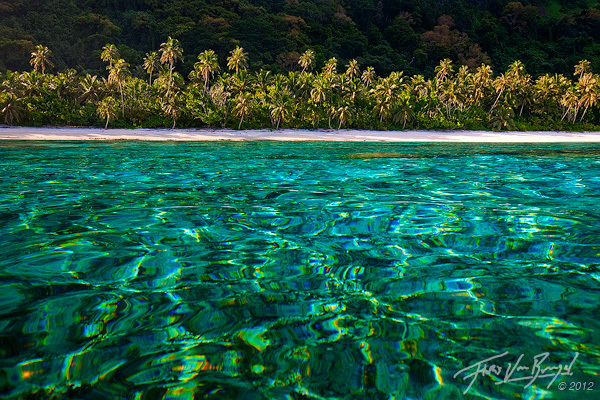 On a still day you can actually see through the surface of the water, up at the tropical sun and bright blue sky. This phenomenon is known as Snell’s Window, and is a result of light refracting through the water, rather than reflecting off of the surface. This only occurs in a narrow range of angles, outside of which you actually see a reflection of what lies below the waters surface. This angle is very difficult to get just right, and snorkeling in shallow water it means photographing while holding the camera below you where you can’t see the viewfinder or LCD screen. So the majority of my images were shot ‘blind’ – I guessed at the focus and composition by looking at the orientation of my camera. About one out of every 600 exposures or so actually worked out. Relative to this, the other challenges – trying to take photographs of moving things while someone (the ocean) is pushing and shoving you around, the light that changes every split second, and the awkwardness of working the camera through a watertight housing – were quite manageable. Overall it was a very fun and rewarding challenge, and given the location it was hard not to be in a dream like state of relaxation. Notes: iso 400 was not the ideal setting here, but when you've got as many things to worry about as you do underwater, it's easy to forget those kinds of things! Alas, after 4 days of swimming in the sweltering heat I had to head back to Tutuila, and soon after that, my home in the northern hemisphere where I promptly strapped on my skis to cool off from the tropical sun. 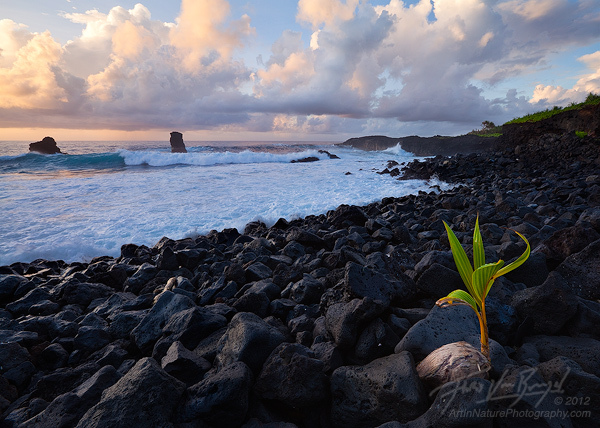 You can my portfolio of images from Samoa on my website, including a few not shown above, with this link: Samoa gallery. What a trip, Floris! Lots of excellent shots, of course, but Alone in the Deep Blue is really evocative for me of small islands on a vast, watery globe. I can barely conceive of those expanses of sea. For all your technical skills — and they are vast — your compositions are impeccable and seemingly effortless. I am always inspired by your art and these images do not disappoint, they simply move the bar even higher. 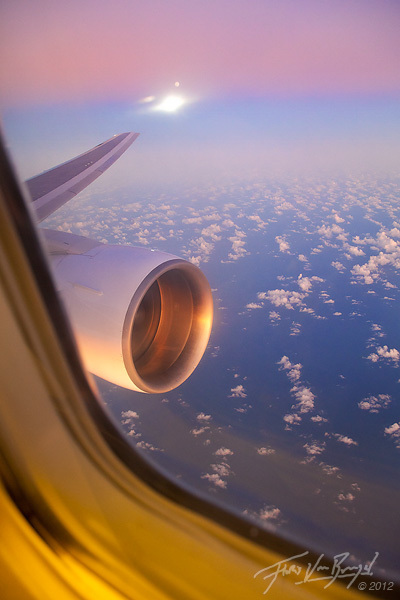 I got to come back to read your write-up in full but just wanted to say, join me in my letter-writing efforts to Airbus and Boeing to build photographer seats into their airplanes! lol From the looks of it, you have gotten one of the better windows though. Awesome work, Floris. The jellyfish image is my fave. Even better than the images is the story of the adventure in getting there. Great read. When are you coming back? And will your pics be published somewhere else? Oh! 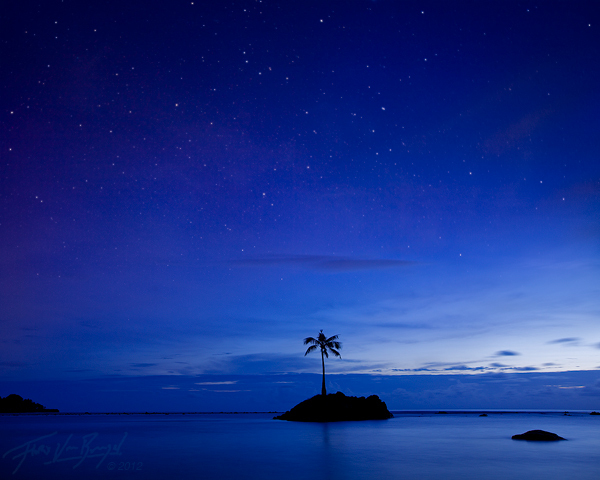 Visit my American Samoa blog. Its cool too. 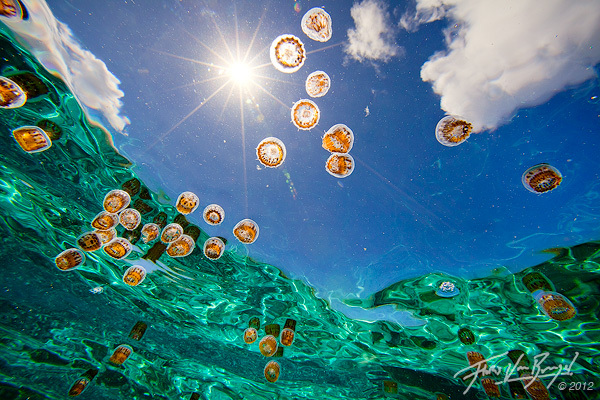 David and Kory – the Jellyfish image is my favorite as well, glad you like it! John – Thanks – I sure hope to visit Ofu again someday! 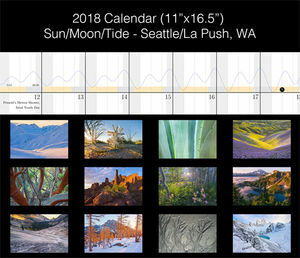 I am hoping to get my images published in a travel magazine that I’ve worked for in the past. Great images, Floris. Sounds like it was an excellent opportunity for both research and photography. Gorgeous images! I particularly love “coconut settler” and “alone in the deep blue”. excellent set…I’m envious, but man you had a great run of images I’m sure they were not easy, but really rewarding to make.